This was her dream and now it has been realized. She loved writing and she was not lacking in talent. She showed it in 2009, when she won the first edition of “The Park’s Tales” literary contest, in the secondary school section. 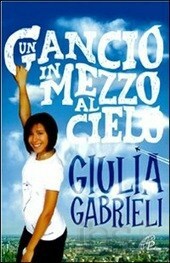 Therefore, while facing her illness, Giulia wrote about her experience, with the aim at collecting her writings in a book which might be a gift: she wanted to give her own account about that “hook in the middle of the sky” she had found and which accompanied her on her luminous path. Now this desire has become a real gift for everybody. Published by Paoline publishing house, “A hook in the middle of the sky”, was issued and distributed in book shops on the occasion of the World Day of the Sick, on February, 11th 2012, the anniversary of Virgin Mary’s apparition in Lourdes. The copyright profits will be partly earmarked to AIRC (the Italian Association for the Research on Cancer) and partly to support solidarity projects for ill young people and children (>>> info)) . In the name of ConGiulia Association, together with her parents and her young brother, we invite you to read the powerful account which Giulia desired to leave us ( available only in Italian language for the time being), hoping that this may help and support everybody on her or his life path, especially those who are suffering in their body and in their souls and are searching for “a hook in the middle of the sky” in their lives.